There are only a few industries in the market with potential and die-hard customers as makeup industry. Beauty products are an important part of a woman's life. No one can deny the importance of cosmetic items in giving us a confident look and feel. Makeup products are always in demand; it means cosmetic brands can increase their sales with creative and unique ideas. The best way to do it is opting for custom packaging. It is the first thing customers see on retailer's shelves. That is why your packaging should be perfect in all aspects. 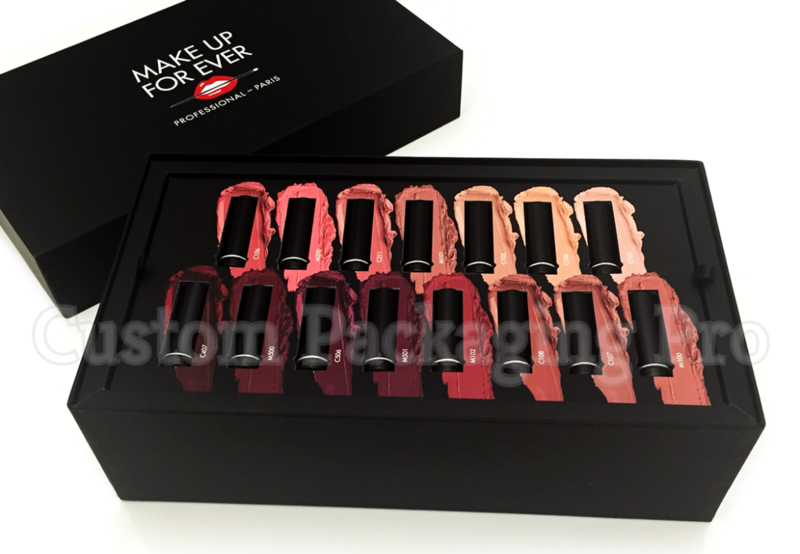 Custom makeup boxes give cosmetic brands an ideal solution to showcase the products. Defining your ideal customers and brand personality is essential for designing makeup boxes. Custom makeup boxes are a perfect way to showcase your cosmetic items. From holding the product to promoting it, makeup boxes can make it all possible. That is why every brand should think of changing their makeup packaging to custom boxes. But elements can make your make up boxes a success?? Many factors come into consideration while designing custom boxes. Here are some features that are must to include. Whether you are designing a new custom make up box or modifying the old one, logo and brand name should be a part of the box. Logo reveals your identity to new customers and help potential customers to easily find your product. The most important thing, it distinguishes your brand from the competition. When it comes to custom Make up Boxes, colors are important features to add. To understand the color psychology of customers is important to make your makeup products successful. Consistent colors of makeup boxes can become your unique identity. Use colors relevant to the product so customers can easily relate to it. The most important thing to consider for make up boxes is what kind of personality or style you want to give to your cosmetic items. The unique style of the box allows you to achieve the set design goals. With style, images have equal importance. Images help to deliver the brand message and let customers know what they are buying. Like styles, the text also influences how buyers will perceive your makeup items. Custom lettering can give your box more professional look. Keep the readability in mind while printing text on boxes. The fonts should be clear and clean, so customers will get the right message. Words come first and appearance after it. Don't fill your makeup box with unnecessary content, it can distract customers. Nobody has enough time to read long paragraphs. Only add necessary details about the product that customers need to know. For brand information, you should add a brand name, address and contact information. It is enough to communicate with potential customers effectively. Some brands still think custom packaging a waste of money while it is one of the top trends in the market. Investing in custom makeup boxes will surely pay you off and more than your expectations. Apart from the basic purpose of packaging, it serves other purposes as well. It helps you to do effective marketing and brand promotion. Take a look at what you can achieve with custom makeup boxes. Marketing and brand promotion is an important factor for the success of any business. Custom make up boxes are an effective way to market and advertise your brand at no cost. With makeup boxes, your brand will reach to more people. It will draw more customers towards your product than any other way. Also, it will be less costly. Makeup items are delicate and tangible; they need special protection during shipping and storage. Custom boxes are sturdier than other packaging materials. It provided added strength and protection to the makeup boxes and protects the make up items from damage and other environmental factors. Also ensures the safe delivery of products to retailer's shelf and to customers. Using Custom Makeup Boxes can increase products visibility and exposure among other similar products. Increased visibility of the product can make your unique identity in the market. The small change in your packaging can result in improved brand prominence on retailer's shelf. Several other customization options can make your product easily identifiable. Designing a packaging that stands out is essential. With extra effort and little creativity, you can come up with a unique make up box. From design to unboxing, you can differentiate the makeup box in all aspects. For great shelf impact and to influence customers, a distinguishable packaging is all that you need. A custom make up box differentiates your brand from the crowd. Custom makeup boxes are multipurpose and useful in many ways. It can grab customer's attention and influence them to buy the product. Displaying your makeup products in custom boxes can give surety to customers that they are buying a quality product. These boxes boost your sales by enhancing the visual appeal of the product. Custom make up boxes are available in several sizes, shapes, and style. With lots of customization options, you can get most out of these boxes. Get the help of custom packaging pro to turn your design thoughts into reality in a more professional way.